How do nerves speak to other nerves or muscles? In response to a change within the body or the external environment, nerves are stimulated. An electrical current travels down the nerve and then across a synapse (physical gap) to another nerve or to an effector cell (muscle, the heart, or a gland) that responds. Is this message transmitted across a synapse by an electrical current or a chemical released from the nerve ending? In 1905, the distinguished British physiologist John Newport Langley at Cambridge University first proposed that a “receptive substance” was the site at which a chemical was released after nerve stimulation. This remarkable concept was based on experimental results obtained by his student T. R. Elliott—results Langley failed to acknowledge. Over the next fifteen years, a number of distinguished scientists conducted experiments, analogous to Elliott’s, demonstrating that the response of effector cells after nerve stimulation and the addition of certain chemicals was similar but not always identical. Otto Loewi, a German-born pharmacology professor at the University of Graz in Austria, long puzzled over how to prove chemical synaptic transmission. On Easter Sunday eve in 1920, the idea for a conclusive experiment came to him during a deep sleep. He scribbled a few notes and resumed sleeping. Upon awakening, he was unable to decipher these notes. At 3:00 a.m. the following morning, while sleeping, the idea reemerged. He rushed to his laboratory, and before the day’s end, performed the critical, yet very simple, experiment. He placed two frog hearts in separate tissue baths, and after stimulating the vagus nerve of one, the heartbeat slowed. He then added this bathing fluid to the second bath, and the heartbeat slowed. Thus, he established the release of a chemical, which he called Vagusstoff (later identified to be acetylcholine), as the first neurotransmitter. He was a co-recipient of the 1936 Nobel Prize and, two years later, fled Austria after the Nazi invasion. More than one hundred types of neurotransmitters have been identified in both vertebrates and invertebrates, and many of these have been shown to play a role in normal physiological function, in disease, and in the development of drugs. SEE ALSO: Animal Electricity (1786), Nervous System Communication (1791), Neuron Doctrine (1891), Action Potential (1939). The neurotransmitter acetylcholine is released from nerve endings to activate receptor sites on the surface of skeletal (voluntary) muscle fibers, causing their contraction. 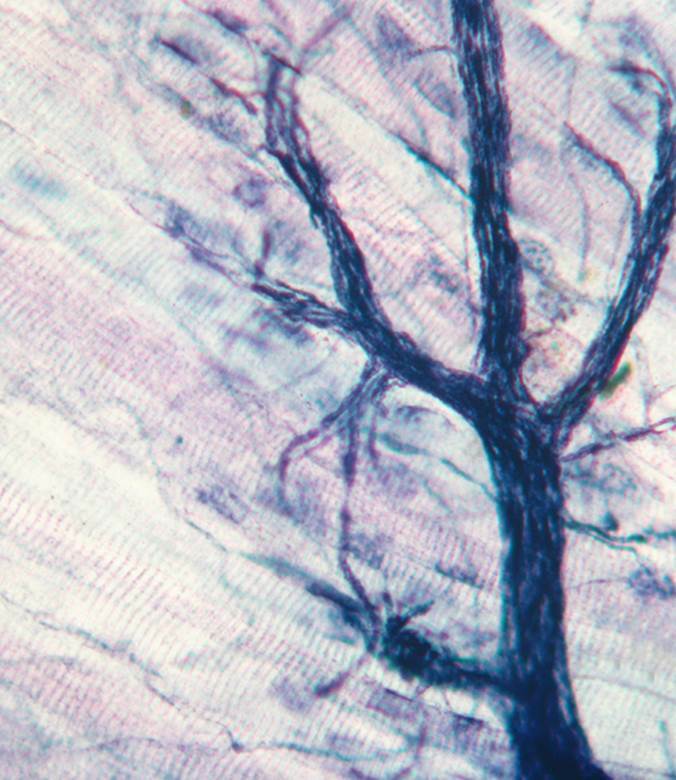 This microscopic view of nerve cell endings in muscular tissue has been magnified 200 times.